All food and beverages. In-room minibars with all drinks. Water activities like sailing and snorkeling. 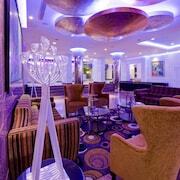 Onsite entertainment and dance classes. All food and beverages. In-room minibars with all drinks. Land activities like volleyball and tennis. Onsite live performances and language classes. Buffet and à la carte meals. Local beverages and soft drinks. All food and beverages. Onsite activities including volleyball and sailing. Onsite entertainment and aerobics classes. Playground. All food and beverages. Land activities like volleyball. Aerobics classes. Children's pool. There is a place where hundreds of years of history, Latin American culture, pristine beaches, and sunsets combine to create a spectacular getaway. A place where you can awaken to the sound of crashing waves, but you don’t have to venture far to find the beautiful chaos and age-old architecture of a world-class city. Santo Domingo, Dominican Republic, has stood strong and proud since 1496, blending Spanish, French, British, and Haitian influences into a tapestry of life that is unique amongst cities, without ever losing its joie de vivre—or its roots. 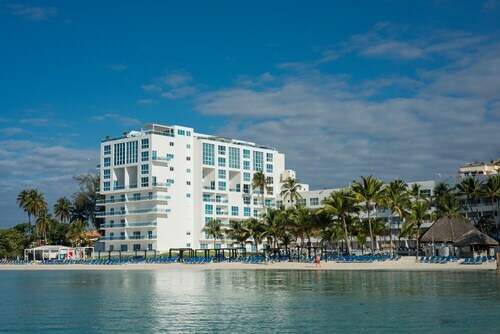 When you have the best all-inclusive hotels in Santo Domingo like the Hotel Zapata as your home away from home, you can look forward to carefree days lounging on powdery sands, exploring one of the oldest places in the Americas, and dining on delicious cuisine unlike any other. Yes, traveler, it is really as perfect as it sounds. How are the beaches in Santo Domingo? In one word, the beaches near Santo Domingo are gorgeous. 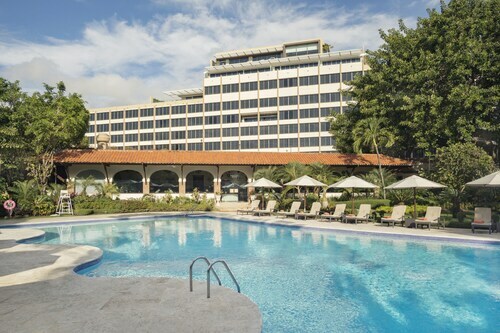 Whether you want family-friendly shores, waterfront restaurants, or swaying palm trees where you can relax in the shade, you’re never far from paradise when you choose all-inclusive hotels in Santo Domingo. 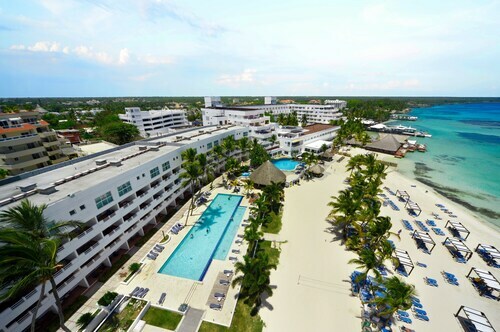 Just 2 miles east of the airport and 20 miles from the city’s Zona Colonial lies lovely Boca Chica, with wide white stretches of sand, lazy coconut palms, and a tranquil lagoon protected by a natural coral reef. The irresistible scents of paella, sea bass al ajillo (with garlic sauce), and sancocho stew wafting from the waterfront restaurants may distract you—but once you are sated, this beach is also an amazing place for a nap. 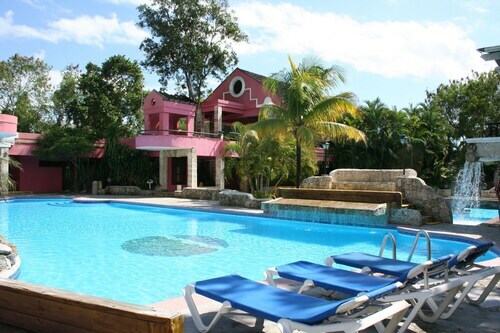 Journey 15 miles further east from Boca Chica and you will discover another slice of heaven at Juan Dolio. Dotted with shady palm trees and stretching for miles, this beach has everything you need for an ideal tropical vacation. 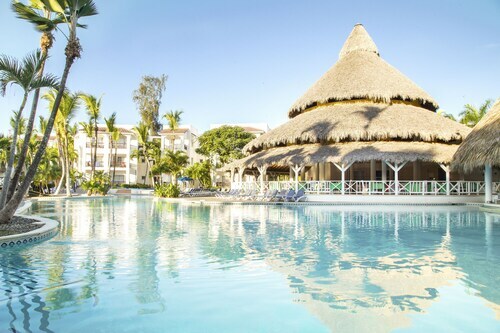 Splash and swim in the gentle waves, relax and recharge in a chaise lounge, or sip an ice-cold santo libre in a thatched-roof bar on the sand. 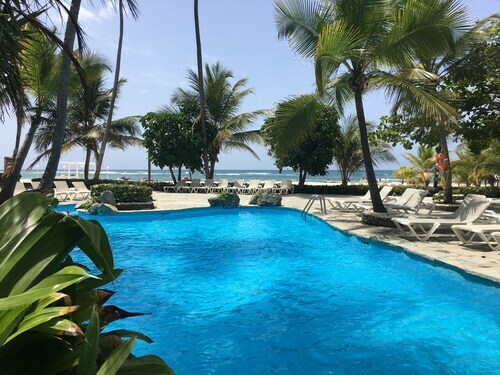 The beach at Juan Dolio is sure to be what you dream of when you imagine your Caribbean holiday. Are there any historical attractions in Santo Domingo? Santo Domingo is full of history—it is the oldest European-established city in the Western Hemisphere. In fact, the entire Zona Colonial is a UNESCO World Heritage Site. Its colorful past shines through in its architecture, from the Baroque Basilica Cathedral of Santa Maria to the 16th-century Fortaleza Ozama, both the oldest of their kind in the Americas. You could plan out the day, taking in the astonishing Gothic buildings, nibbling on delectable bites as you people-watch in the Parque Colon, and visiting the numerous museums. Or, you could simply wander the cobblestone streets, finding surprises around every corner. 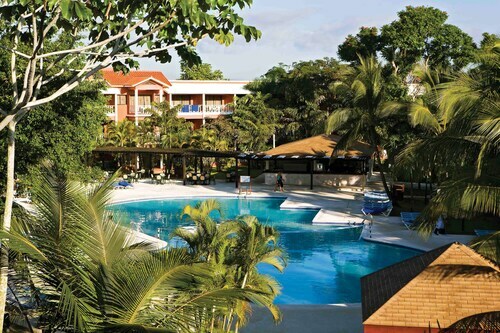 Laid-back days filled with ice cream, coffee, and memories await when you book a Santo Domingo all-inclusive hotel. Start your search right here on Travelocity, and you’ll find the largest selection and best deals on the internet. 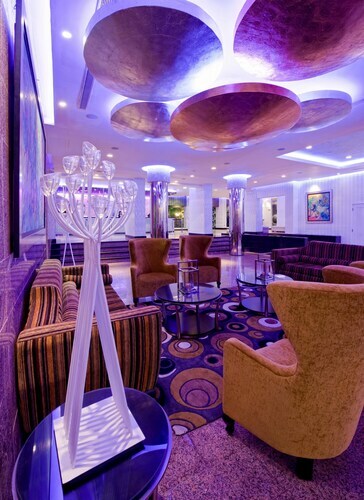 All-inclusive accommodations like the Renaissance Santo Domingo Jaragua Hotel & Casino is ready to introduce you to this fascinating city. It’s time for an unforgettable trip—you deserve it! 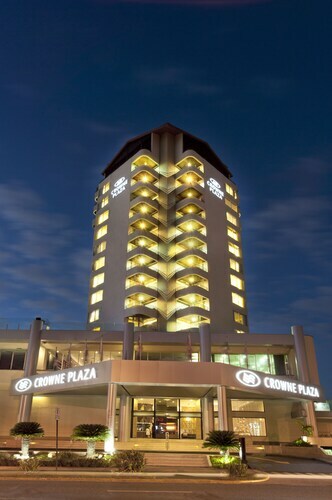 The place is nice and the staff are very welcoming and always ready to help. Poor communication between the front desk and the staff and the security guards. Loved the location of the property, many bars to choose from, beach is beautiful. 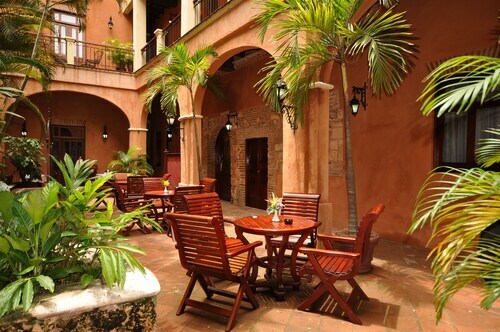 The hotel is located in an excellent zone for the city of Santo Domingo. The Avenue is very busy and there are many attractions nearby.